This post details my experience with creating a simple two-tier app using Google Cloud Platform (GCP) as well as Amazon Web Services (AWS) by taking advantage of the free tier accounts for each service. Connect via SSH to each VM to install appropriate packages and run the relevant services. 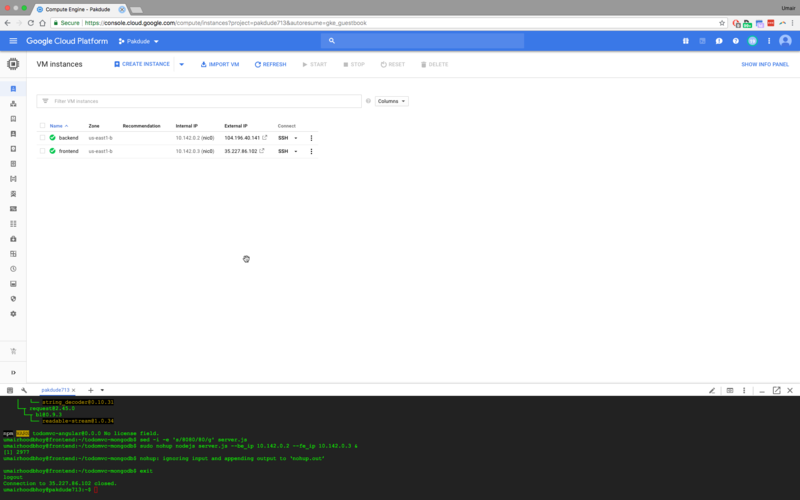 In GCP, I started by creating each VM instance separately. In AWS, however, EC2 let me specify 2 instances to create simultaneously with the identical settings other than the IP addresses. First, I created the Backend VM that ran MongoDB. The only customizations required were to select a Micro instance (to incur the fewest charges on my Free Tier account), specifying Ubuntu 14.04 LTS as the OS, and opening up HTTP for the Frontend and Backend VMS to communicate. In AWS, I did this by applying a Security Group to the instances that opened up port 80. Next, I created the Frontend VM that runs the Node.js ToDo application with the same customizations that I applied for the Backend VM. Once both VM instances were created, I connected to them via SSH. GCP offers a built-in browser-based terminal utility called Cloud Shell as an alternative to Terminal (Mac OS) or PuTTY (Windows). gcloud compute --project "pakdude713" ssh --zone "us-east1-b" "backend"
Create a directory for MongoDB and then run the MongoDB service in the background on port 80. These IP addresses are the private IP addresses generated by the GCE instances. For AWS, I replaced the IP addresses with the ones generated by AWS EC2 instances. And that’s it! 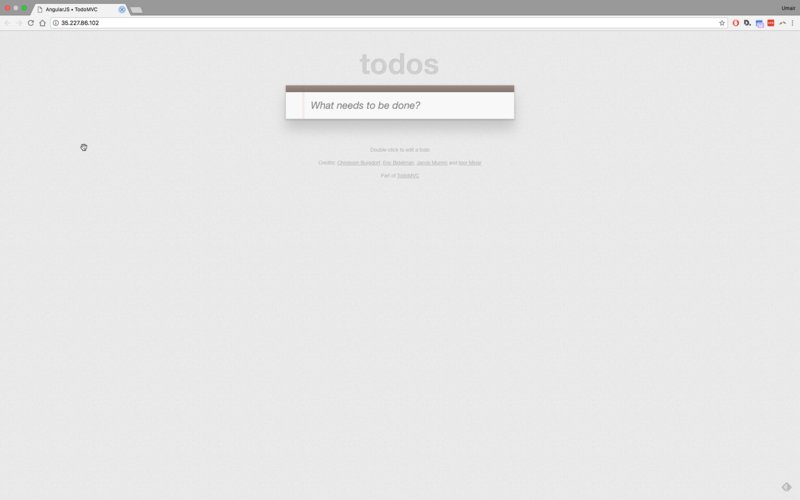 In GCP, I launched the ToDo app by visiting http://35.227.86.102. In AWS, I launched the same app by visiting http://52.91.39.48. It sure has been a while since I’ve written here. 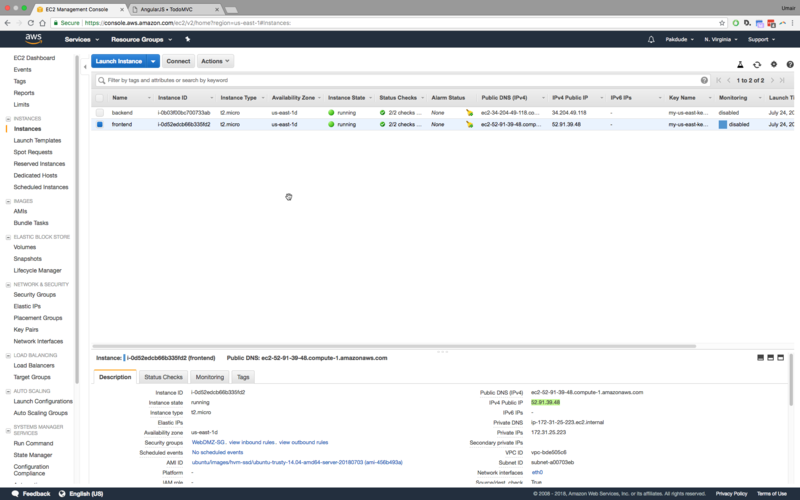 Lately I’ve been experimenting with the free-tier accounts for both Amazon Web Services (AWS) and Google Cloud Platform. I’ve been trying to achieve the same things on both platforms and will be sharing my experiences in subsequent posts. I hope you can stick around to read them!